I have posted information about the programs that I teach under for the City of San Jose. At different times they had two versions of a “gym-like” program (Group Ex and then SJCITY Fit) where people could purchase an annual membership and attend all of the classes offered under the program at the participating community centers. There is also the program many seemed to be familiar with, where the city sends out a brochure listing all the classes available. The classes are taught in “sessions”. You might want to take guitar lessons being offered for 10 weeks one night a week. You register for the class paying for the entire session, all 10 weeks. There is no make-up if you miss a class. This is the way that I have taken classes with the cities of San Jose, Santa Clara, and Campbell as long as I could take classes. I remember taking a babysitting class when I was young. The “gym-like” program was relatively new. It was a great program, but I am betting that most you reading this that are local didn’t even know about it. It seems like a fair job of promoting it was not done. It was impossible to use the internet to find any information about it and like, happens with all things when they don’t get properly promoted, they fail. The city has determined that the current version of the “gym-like” program – SJCITY Fit – is not sustainable so they are cancelling it. There are members that take at least one class Monday through Friday. It was a great deal. The majority of the students that came to my class loved the program because when the math was done with them going to at least one class a day Monday through Friday, it was about 50 cents per class. So, yeah, it makes sense that the city wasn’t able to maintain that. But it is sad that the program could not attract more than 140 people. I keep thinking in a city with a population of over 1 million the program could have at least attracted 500 people. But with so many different choices for the exerciser out there it really takes a strong desire and a concentrated effort to get the word out about exercises programs. So the city it moving some of the classes that were be held under SJCITY Fit into a hybrid of the leisure program (where students sign up for a session of classes). There are a multitude of things that are different under this program, so I will only be teaching Nia once a week on Tuesdays. Now, in order to take Nia with me through the City of San Jose you have to sign up for the sesssion or “season”. So far there are two sessions/seasons on the books (Winter and Spring). They are both 10 classes each. I say classes because there are some weeks where there is not a class so it might end up being more than 10 WEEKS, but there are only 10 CLASSES. You can see more information on my site. I am still teaching the yoga classes, one on Tuesdays at 10:30 am and one on Thursdays at 6:00 pm. It is very sad that this program or a version of it was not salvageable by the city. So many of the consistent exercisers are moving off to other places, some I am afraid might stop exercise altogether. I will miss seeing them every week. I’ve been teaching Nia on Tuesdays for six years, on Thursdays for five years, and on Fridays for three years. Many students have been coming that long or even longer (on different days at the various places I have taught). I did write a post on the how long I have been teaching what. I do hope to see some of my students taking part in the new program that is being offered. It might not have the convenience of SJCITY Fit, but it is still a great deal. The program will still offer 8 of the 12 classes that were offered under SJCITY Fit. So, here is to a new chapter of San Jose Nia. I am looking at teaching at a studio right down the street on Union from where I teach now. I am hoping to teach my Thursday Nia class and my Thursday stretch class. So stay tuned. We have such a great little Nia community in San Jose I hope we can keep dancing together! Here’s to the New Year and to a new chapter of San Jose Nia. Do you take classes through your city’s exercise program? I am going to address this again because so many people are not aware of the programs in San Jose that are available through the Parks and Recreation Department. Back in 2015 I wrote a post explaining the main difference of two of their programs. To summarize, there is the program that many of you are familiar with because many of us grew up with it, that is the program the city calls the Leisure Class Program. These are classes in the booklets the Parks and Recs Department prints and sends out. There are ALL types of classes – don’t let the name “Leisure” fool you. There are language classes, art and craft classes, music lessons, cooking lessons, dance classes, exercise classes . . . .and a lot more. They are set up in sessions where you register and pay for the entire session before the first class. The session consists of a set number of meetings and when you register you pay for all of them. You may be familiar with those types of classes . . you may have even signed up for one of those sessions and had it cancelled because not enough people signed up. That is always disappointing . . . that is why it is important to sign up early. Anyway . . . there is also another program called SJCITY Fit . . . it is a version of Group Ex which was discontinued in 2015. But it is somewhat the same in that it is like a gym membership. You pay monthly and you have access to all the classes that are in the SJCITY Fit program, PLUS the gyms at three locations. The SJCITY Fit Program classes are exercise classes. There are a lot of people who are not aware of this program that the city offers. I talk to people all the time that think the exercise classes through the city of San Jose are just the leisure type of class. I teach both. I teach some SJCITY Fit classes and I teach some Leisure Classes. There are benefits to both, so it really depends on what works for you. But it is nice to know that you have options. There are some people who like to go to a class everyday. For the people who just want to have a class to go to every day, the SJCITY Fit program is great. 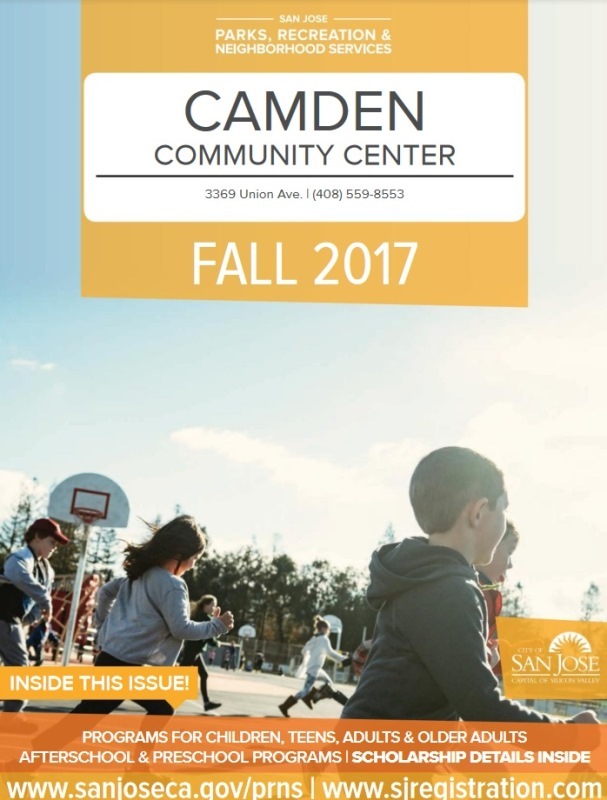 The SJCITY Fit classes are offered at three of the community centers in San Jose; Camden, Almaden, and Bascom. Some people like the convince of going to the community center that is closest to their house, so they might join the Leisure Classes. There are a lot more community centers that offer the Leisure Classes. It all depends on what works for you. The SJCITY Fit classes are on-going . . . meaning there is no end. Yeah, sometimes there might be a cancelled class if the teacher has an emergency and can’t get a sub in time, but the class is scheduled to just go on and on. I have all of my classes on my website, but since I teach for BOTH programs it might be confusing sometimes. I think it is important for you to know the difference so you can decide what class you want to take. At the time of this post, under the Leisure Program, I teach two yoga classes. 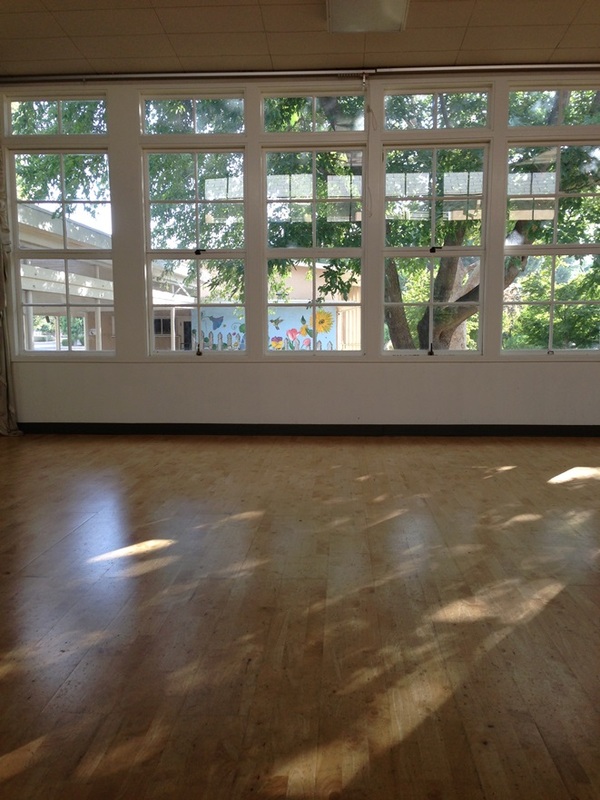 One class is at the Cypress Community Center and the other one is at the Willow Glen Community Center. You register for the session. Although Cypress is unique and will allow you to drop in. But typically, with Leisure classes, you need to register for the entire session. At the time of this post I teach THREE NIA classes under the SJCITY Fit program and one stretch class under the SJCITY Fit program. So for one monthly fee you can take all four classes a week. PLUS attend all the other classes that are offered through the SJCITY Fit program PLUS go to the gyms. If you don’t want to join the monthly membership you can drop in for $6.00 per class. Usually . . . although I can’t say for sure . . . but usually . . the city has a special at the end of the year. They offer an annual membership for a great deal and you just buy that and you are set for the year. But they do not offer the annual membership all year. It is usually for a limited time. After that time is up any membership purchased is only monthly. We will see what they do at the end of this year. I will keep you updated. I just wanted to share – trying to get the word out there – and try to clarify that there are two ways you can exercise with the Parks and Recreation Department of the City of San Jose: SJCITY Fit and Leisure Classes. These are GREAT programs – hopefully you will take part in what the city has to offer! Did you know that the City of San Jose has something akin to a gym membership? Did you know that “Leisure Classes” include EXERCISE classes, too? Many of you are familiar with Parks and Recreation Departments and classes they run through the Community Centers. These are classes that are in the booklets. There are ALL types of classes. There are music lessons, arts and crafts, exercise classes, cooking classes, language classes . . . . just all types of classes. They are set up in what many community centers call sessions. There might be a flower arranging class that is an eight week session, just meaning that there are eight times that class will meet. People must register and pay for all eight meetings prior to the first day of the class. Some of us have experienced the disappointment when we register for a class only to find out a few days before it is supposed to start, that not enough people have registered so the class is cancelled. That is always a bummer. In the City of San Jose Parks and Recreation Department they call these classes leisure classes. Presently there is also something in the San Jose Parks and Recreation Department called Group Ex. Group Ex is exercise classes. The Group Ex is more like a gym, in the sense that you pay a membership fee and then can attend any of the classes that are in the Group Ex program – plus the gym/exercise room – for that one fee. The Group Ex structure also allows for “drop-ins”, where people can participate in a class for a fee without having pre-registered or to be a member. These classes are on-going so they don’t have the same type of structure as a leisure/session class. There arewere two ways you cancould become a member, one is monthly or you cancould purchase an annual membership. Both ways allow the member to attend any exercise class that is part of the Group Ex program. This program really got people out of the house and exercising. The cost of membership was unbeatable. Most of the people who come to my Nia classes go to multiple classes per week, sometimes multiple classes per day. I hear them plan their weeks and their days with each other. They have it all worked out . . . their workouts. I have been wanting to post something about the differences between Group Ex and Leisure classes for a long time. Because I teach both. The differences confuse some people. Some people are familiar with the leisure class way and they don’t even know there is something like Group Ex through the city. Some people who have never taken a leisure class (before there was even such a thing as Group Ex) are not familiar with that. So when I go to explain the different classes I teach it can be confusing. So I have been meaning to post something about it to help clarify. Well, I guess the time is now. It is now because the city of San Jose is discontinuing the Group Ex program as of January 31, 2016. They are only going to have leisure classes. So that means that any class they have that you might want to take will be offered in “sessions”. So you will have to sign up for the entire session in order to take the class. I want to let people know that just because the Parks and Recreation Department calls it a leisure class doesn’t mean it is just about “leisure”. They still might be offering some of the same exercise classes that are presently a part of the Group Ex program that allow you to get your workout on. It will just not be the type of format that you can just take anytime you want. You will have to sign up in advance for the entire the entire session. I don’t know what classes they plan on offering, but I wanted to finally get a post up about the difference between leisure classes and Group Ex so when the time comes people will know the difference. We still have three months of Group Ex before the change occurs. Next month on Wednesday, November 4, 2015, we are going to have a Nia class at 10:15 am at the Camden Community Center. So there will be four Nia classes a week at the Camden Community Center until January 31, 2016. Click here to see a copy of the notification sent out from the Parks, Recreation and Neighborhood Services. I hope you will come dance with us at the Camden Community Center before the end of January! In my post about Nia Routines in February of 2010, I stated I would explain more about what we receive on a Nia Routine Teacher DVD. A comment with questions on a recent post (Nia Routines I’ve Learned), reminded me that I needed to do that. Over three years later, I am explaining what we get. I also wanted to share what is in the Nia Training/Continued Education package as a whole. We get a LOT. It is more than just music and routine. The amount of time and effort and all that goes into our training DVD/package is awesome. I know that even though I see the results and I think it is a lot, there is probably so much more that goes on in the background I would be even more impressed. Since we get so much I am finding as I type this that it is a longer explanation than I like to have in one post. 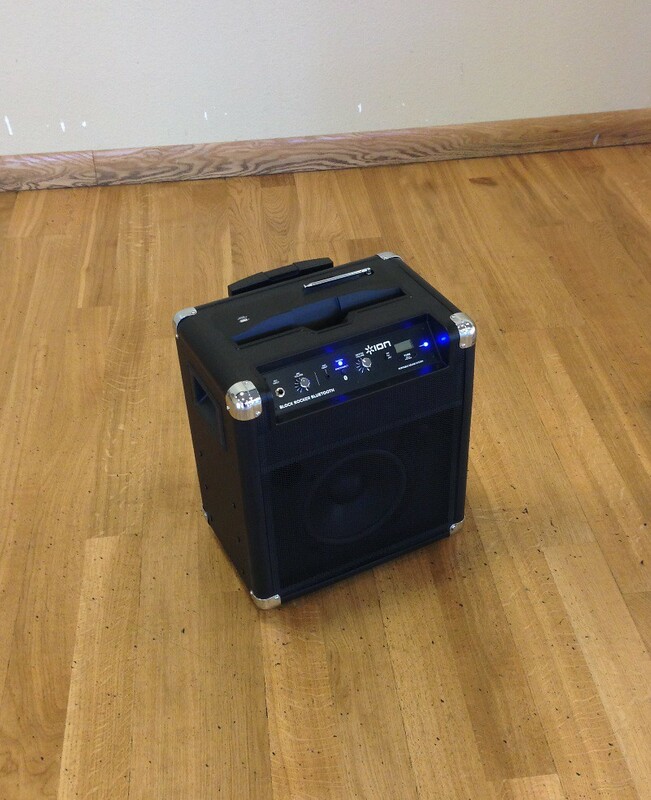 So this will be part one of what is in a Nia Routine Teacher Training package. 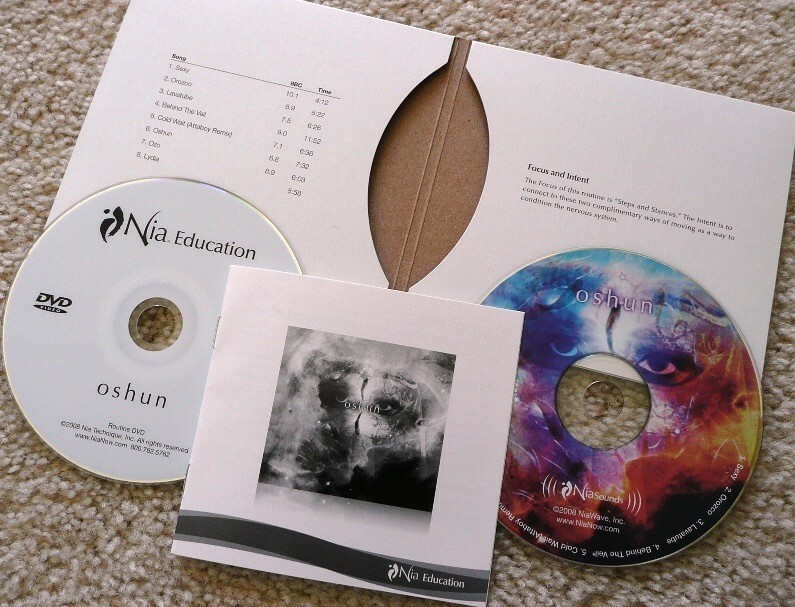 When a Nia Teacher receives a “Nia Routine” there is a CD and a DVD. We used to receive a pamphlet within the package, but now we have to print those out ourselves if we want a hard copy. But basically a training routine package is CD, DVD, and pamphlet. The CD and DVD are in a cardboard holder, one side has the list of songs with the 8BC and the time shown. The other side has the Focus and Intent that the routine was created with. The back of the holder states the name of the routine and the creator, along with a paragraph about Nia Technique’s thoughts on routines. The CD is a typical music CD. It has music on it. But as a Nia Teacher or student you know there is nothing really typical about Nia routine music. 🙂 The songs play one after the other with no pause unless the song itself has a pause before the music begins or after the song ends. Or I guess the engineer putting the CD together could put a pause in. 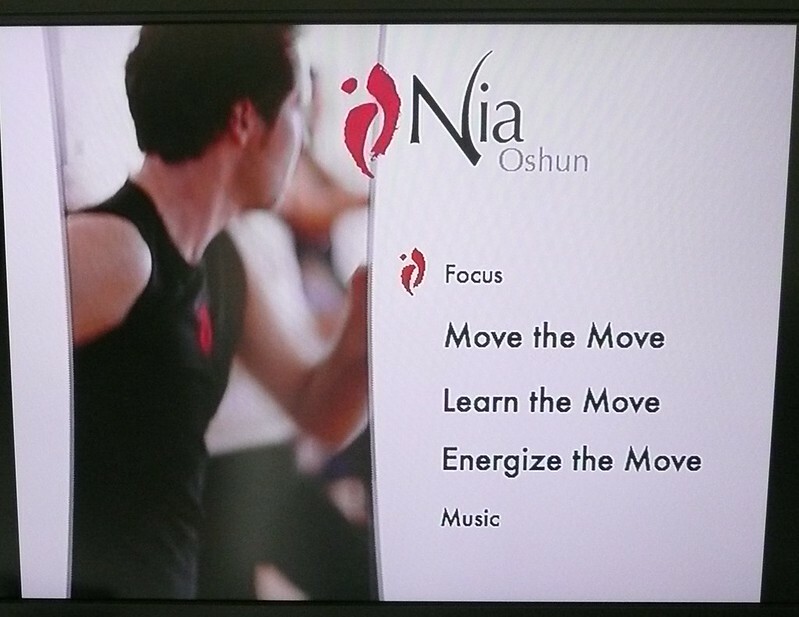 The DVD consists of five sections: the Focus, Move the Move, Learn the Move, Energize the Move, and the Music. The “Focus” portion of the DVD is the creator (or one of them) talking about the focus and the intent of the routine. Often times they explain a bit about how the focus relates to the choreography. For example if the focus is “Steps and Stances” it might be mentioned that there are a lot of opportunities in the routine to experience all six stances. “Move the Move” is the routine filmed almost as if you were taking a class. Sometimes they change the camera angle, but it is still basically as if you are taking a class. * The music is playing and the teacher is teaching. *There is one routine I have in which it was filmed with the class FACING the camera the entire time. I do not care for that at all. I like it when the camera is BEHIND the teacher with the mirror in the shot and it is as if I am standing behind the teacher taking a Nia class. I don’t know if there are other routines in addition to Birth that is filmed with the teachers and the class facing the camera, but I will inquire before I purchase additional routines. Often times in addition to the teacher demonstrating different LEVELS of a move, they will demonstrate a lot of different moves that CAN be done while doing the routine. I always have to remind myself that just because they are showing us multiple ways to do the move or multiple ways in general to move to the music it does not mean I need to put them all into the routine when I am leading it. They are just showing examples as to what can be done. I find it very funny that a lot of the times Carlos was not even doing what he explained the choreography to be. To me, he often just let his spirit go and he danced to the music that he clearly loved. In his spirit dance he was able to show a lot of different things that could be done to the music. As you can see this post is a bit long in itself. I have only touched upon two of the sections included on the training DVD. So stayed tuned for part two where I give a brief summary of the sections: Learn the Move, Energize the Move, and the Music. Do you like to take lead follow exercise workout classes where the teacher is facing you? Or would you rather have the teacher’s back to you? You might have gathered from my posts that I am not a fan of beans. Beans are great for fiber and protein, but I just don’t like them all that much. I was sometimes ok with garbanzo beans/chickpeas, but that was it. I didn’t like any other type of bean, but I went to a friend’s house and she had this yummy two bean salad. So I decided that I am ok with red kidney beans and garbanzo beans in this salad. Then I came across a recipe that had kidney beans it in and I decided to use half kidney beans and half garbanzo beans. This recipe is one of my husband’s and mine favorites. I also like roasted garbanzo beans. Recently I was in the area – after teaching a Nia class as a sub in south San Jose – of a store that I have been hearing a lot about. It is called Sprouts. The name is “Sprouts Farmers Market: Healthy, Natural & Organic Grocery Stores”, which I don’t really understand, as it is NOT a farmer’s market and not everything is natural nor organic. They have the produce section kind of set up like you might imagine a market on an actual farm in that nothing is in nice neat rows and it seems kinda hodgey-podgely put together . . . but that is it. Their organic section of fruits and vegetables was no larger than the one at my “regular” grocery store. But whatever, I digress (WHAT? ME? NO!) . 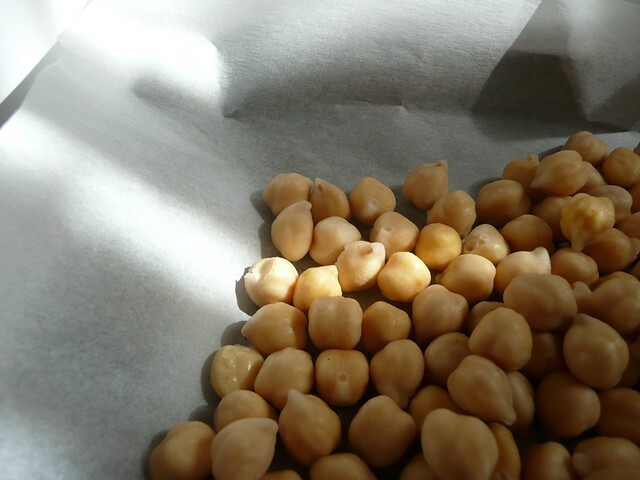 . . my post is actually about that fact that I bought some dried garbanzo beans. When I first discovered the Red Beans and Rice recipe my friend and I were talking about dried beans and we wondered if we could buy dried garbanzo beans. Later she reported back that she had seen some in the store. I had asked my chef friend about them and she gave me some advice on how to process them. And of course I forgot what she said. But anyway . . . I finally was in a store that had them when I remembered to look. So I bought some. 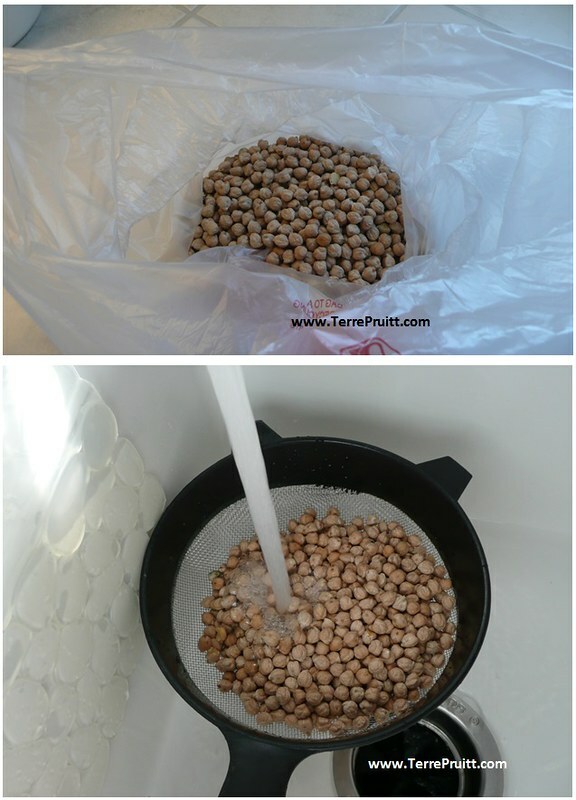 When you look up how to process dried beans on the internet you will probably come across two different methods. There is the long soak and then the quick soak. My idea was to do both and then report the results on my blog in one post. But funny as it sounds, I have not had time — more accurately, I have not made time — to do the quick soak method. I know, you would think that would be the easiest and fastest one to do. 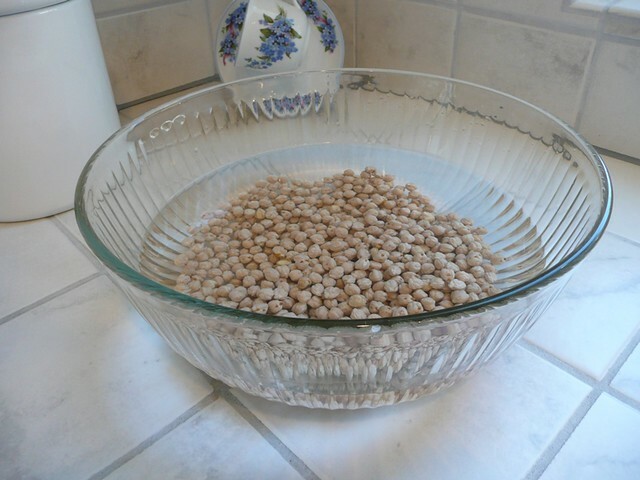 But to me it was much easier to throw the beans in a bowl and let them soak for 13 hours and 45 minutes. I’ve read they should soak for at least 4 hours. Mine just turned into 13 hours plus. Since I have not yet gotten around to doing the quick soak method I will report on what I found with the long soak method and then when I do the other one I will post about that. The “long soak” method has no cooking involved. I was interested in not cooking the beans. Everything I read said that they double in size. I don’t recall that happening. NOTHING I read told me they would pop! I kept hearing this odd sound and wondering what it was. If you have a pet you might do as I do and the first thing I do when I hear something unfamiliar is I blame my pet and find her first to see if she was responsible. But when I heard the pop she was right next to me. So, I kept thinking it was coming from outside. Finally it dawned on me that it might be the beans and I stood by the bowl until I heard one! I had decided to split the bag in between the two methods. So I got a huge bowl and put half of my beans in it. Then I filled it with water. I did this at 11:00 am on a Friday. I changed the water twice. I rinsed the beans both times. My report is that beans themselves have gas. My kitchen smelled gassy the whole time the beans were soaking. I kept lighting a candle. I drained the beans at 12:45 pm on Saturday. I decided I was going to roast them. So I drained them to let them start to dry out. I roasted them. They were gorgeous. I like them because they seem less “mushy” than the canned beans. And for me “mushy” is part of the reason I don’t like beans. So I really liked this dried/soaking method. I left the beans in the oven a tad bit too long. I was doing too many things at once and when I took them out to check them I forgot to put the timer on when I put them back in. I realized my error when I smelled burning beans. So . . . . they are ok, but not as I would have liked them. The verdict in regards to soaking beans is good. I am going to do that. I have a feeling that soaking them will turn out to be easier than the quick soak method. We will see. The questions I have been thinking about though is . . . . the canned beans I buy say “Organic” whereas the dried ones I bought did not. So really which are better? I will look for organic dried beans, but I am not sure where to find them. I know I didn’t see them at the “Farmers Market” that claims to have healthy, natural, and organic food. 🙂 Well, at least I didn’t see a sign that claimed the dried beans were organic. Do you used canned beans or dried?